Factories 'Reshore' Some Work From Overseas Manufacturers cut millions of jobs during the recession. But since 2010, U.S. manufacturing employment has been ticking back up, with companies adding about 400,000 workers. At least a small portion of that growth came because of the return of factory work from abroad. During the worst of the Great Recession, U.S. factory jobs were disappearing at a furious pace. As 2007 began, about 14 million Americans were working in manufacturing. Three years and one frightful recession later, only 11.5 million were. But since 2010, employment has been ticking back up, with companies adding about 400,000 jobs. One reason for at least a small portion of that growth: the return of factory work from overseas. Experts say it's difficult to accurately measure the number of jobs tied to work returning from other countries, but some employers say they know it is happening. Howard Hauser, a vice president with Hiawatha Rubber Co., says for a long time, manufacturers followed a herd mentality of sending work offshore. They all wanted components produced in low-wage, emerging markets like China. "They were looking at the piece price. And it looked like, 'We're going to save a lot of money,'" he said. "But the bottom line was they didn't save nearly as much as they thought. And with the quality issues, they're just not getting product that's acceptable for the customer." Now Hiawatha, based outside Minneapolis, is getting those contracts. And Hauser has himself decided to "reshore" production of a component that was being made in China. The move will result in three new hires at his plant. He says the part was not difficult to make, but the Chinese factory kept botching the job. He says Hiawatha, which makes rubber components for equipment such as printers and pumps, can do it better. 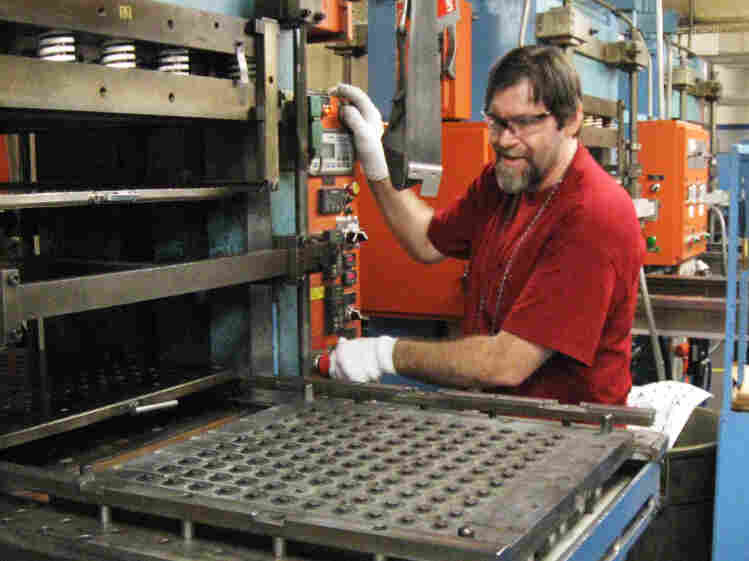 Richard Beaulieu operates a molding machine that makes rubber parts for radiators at Hiawatha Rubber Co., just outside Minneapolis. As business picks up and hiring resumes, the employees at Hiawatha are feeling more confident now. But it's still painful to recall the recent tough times when orders dropped off about 40 percent and production hours were slashed. One worker, Richard Beaulieu, says he had to make do while working just three or four days a week. That went on for nearly a year. His memory of that lean time: "Many, many months, and a lot of soup," he says. "But you just buck it up and get through it." Beaulieu and the other 65 full-timers are back to normal hours now — and can even count on some overtime. 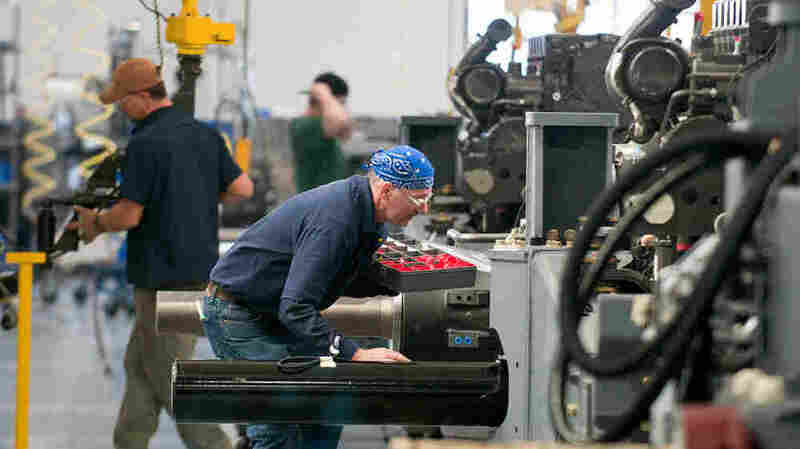 Dan Meckstroth, an economist with the Manufacturers Alliance for Productivity and Innovation, says labor in the United States is looking more competitive internationally for a number of reasons. For one, U.S. wages are still depressed because of the relatively slow overall recovery. At the same time, wages have been rising in emerging markets. In addition, the skill level of American workers is generally higher. And the supply chain disruptions after last year's Japanese disasters made some companies skittish about outsourcing to Asia, he said. But Meckstroth says it's hard to quantify any job gains from "reshoring." The number may not be great, but at least the trend line is good, he said. "I'm not saying there's a tsunami of production coming back to the United States. It's a trickle," Meckstroth said. "But a trickle back is better than the tidal wave out." But at Hiawatha Rubber, Hauser does not think the future of manufacturing lies in bringing work back, even if that's benefiting his company now. He believes greater productivity for the sector will come through increased automation. At his factory, more automation will eventually mean fewer workers. But the workers who do remain, he says, will be high-skilled and high-paid.